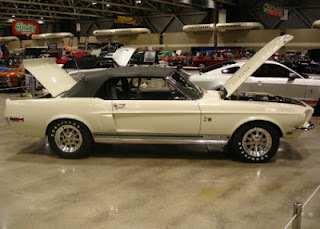 There’s been a lot of coverage of Carroll Shelby’s life and career over the last few weeks. He did a lot of different things but will probably be best-remembered for his cars. According to Richard Sevenoaks, the president of Leake Auction Company, “Carroll Shelby transcends generations and his name is synonymous with muscle cars. There is not a guy out there who does not lust after a Shelby.” There’s a few of us girls who wouldn’t mind getting our mitts on one either. Here’s our chance. The Leake Auction Company will have several on the block at their 40th annual collector car auction to be held in Tulsa, Oklahoma, June 8 through 10. If you’re in the neighbourhood, it might be worth going just to look at the cars. Regular admission is only $15. 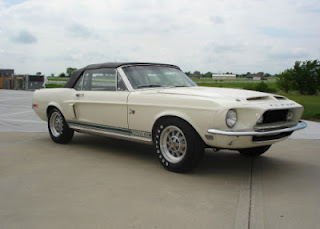 Apart from this gorgeous 1968 Shelby GT500KR convertible in white, there are also two more Shelbys from 1968, a GT350 Fastback and a GT500 fastback, both in gold. Looking for a more modern GT? They’re offering a 2006 Shelby GT-Herz and a 2007 Shelby GT, both in black, as well as three 2008 GT500s, two convertibles and one fastback, plus a couple of 2011s. 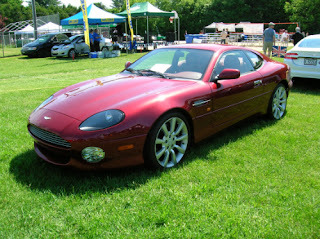 You can find out more about the auction, and the other vehicles for sale, on their website. 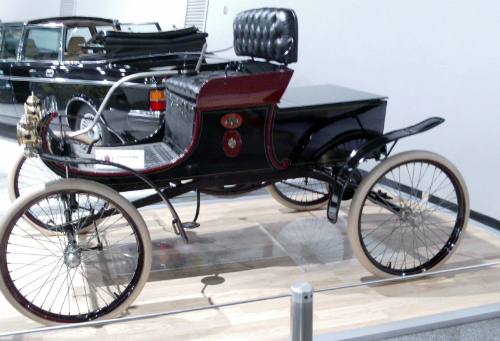 Wikipedia says the curved dash Oldsmobile, built from 1901 to 1907, was one of the first cars to be built on an assembly line. 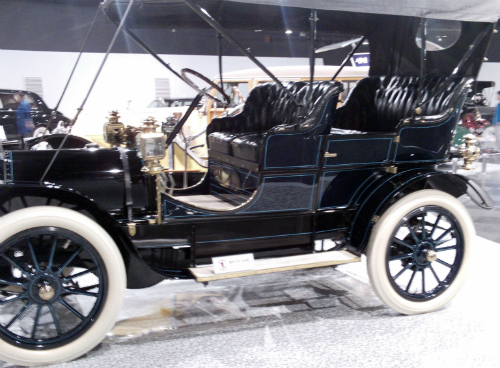 Nearly 200,000 were produced over that period, but only 425 of those were made in 1901, like this model. HowStuffWorks offers a more detailed history. While Ransom Olds had been building cars for a while, this Oldsmobile was the first one to actually go into production. The company got bought out by General Motors in 1908, who continued to make Oldsmobiles until 2004. The body’s not too far removed from a horse-drawn carriage, with the curving bit at the front being the dash. It was there to protect the driver from mud and other debris thrown up by the wheels, with nary an instrument cluster to be seen. Yes, that Sears. These used to be sold through the Sears, Roebuck & Co. catalogue and delivered by train. Some assembly required? 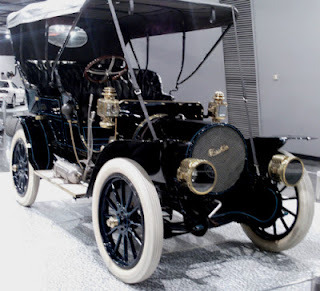 According to the Bob & Sallie Connelly auction site, Sears offered these vehicles built by the Lincoln Motor Car Works (no, not that Lincoln) from 1909 through 1911. At that point, they decided they’d lost too much money and stopped selling them. Like the Olds, the Sears High Wheeler is steered by a tiller. A huge jump forward in appearance from the 1911 High Wheeler to this 1925 Austin. It no longer looks like a carriage, and has a recognizable front end covering the engine. It looks like it has less space, though. I’m not going to trace Austin’s convoluted history (see Wikipedia for details), but the company was founded in 1905, with the first cars being produced in 1906. 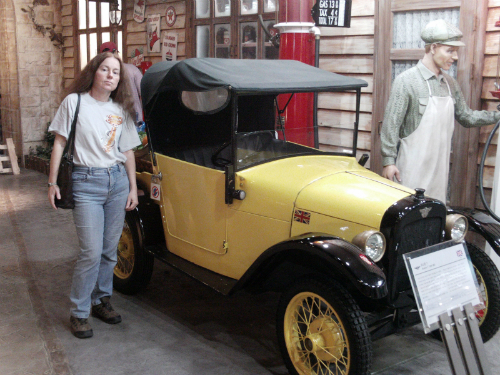 The Austin 7 first showed up in 1922. It was meant to be cheap—somewhere around $450, and simple to maintain. That was a good call on Austin’s part. Unlike many other companies, they survived the Depression. 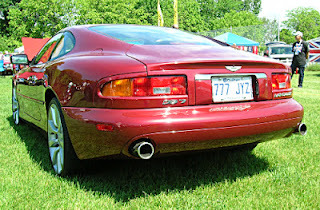 Judging by the number of images that showed up in my Google search, the 7 is still popular today. 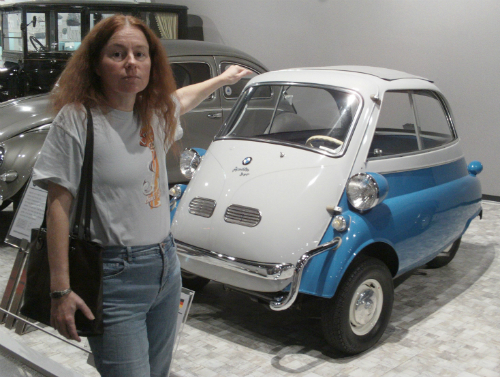 There’s one more category of vehicles in the Samsung Museum’s first floor to look at: Cars in Film. Here we have a ’77 Beetle made to look like Herbie the Love Bug. 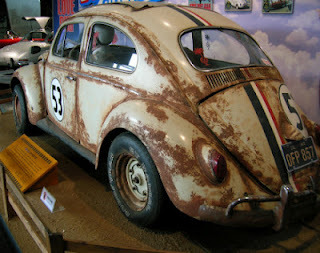 The original 1968 Disney film The Love Bug actually featured various 1962 to 1965 VWs that played a race car with a mind of its own. Poor old Herbie’s looking a little worse for the wear in this scene. And here we have a DeLorean like the one in the 1985 Back to the Future feature film. 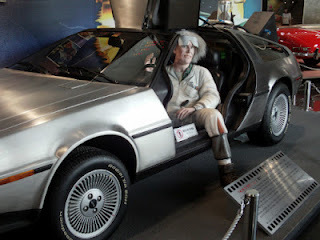 Can it really travel through time? 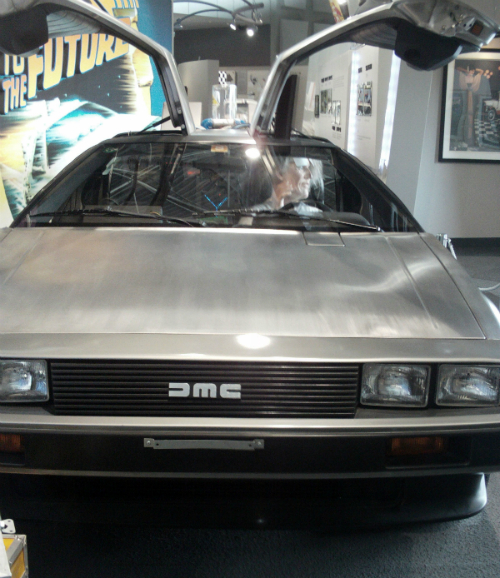 Doc might think so, as he’s staring across at the 1955 Mercedes Benz 300SL gullwing coupe. I doubt it was coincidence that the two gullwing cars were placed so they could easily be compared. The DeLorean does not come out on top. Tomorrow I’ll start looking at all of the uncategorized cars, beginning with the curved dash Olds. 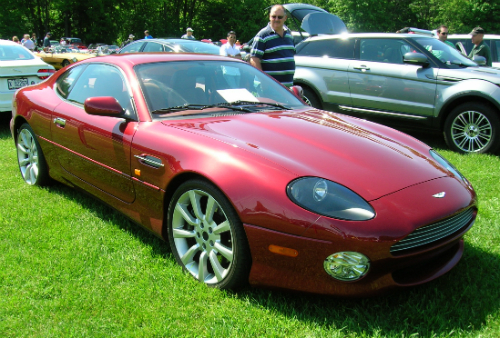 I went to a British car show nearby on the weekend. 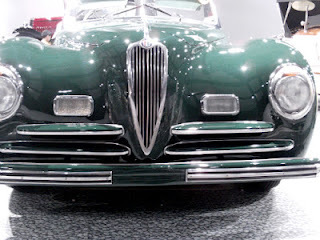 While all of the cars were British, not all of them were classic. Spotted several recent model Minis and Range Rovers, for example. Didn’t bother shooting any of them, but when I spotted this baby, you bet I took a few photos. It’s the closest I’m ever likely to get to one. I’ll be posting more from the show later, once I get my pictures sorted and finish my series on the Samsung Transportation Museum. 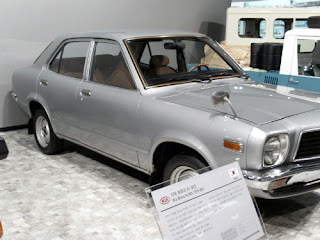 I’d hoped to see some classic Korean cars at the SamsungMuseum, since I certainly hadn’t seen any on the roads. 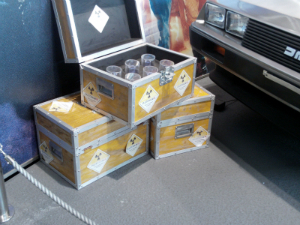 There weren’t too many on display at the museum either. Their website lists four, but I only managed to get pictures of three, plus a classic Datsun. They must change their displays from time to time, because while researching some of the other cars, I found a blog entry from 2008 by Rachel So, talking about her visit. She has details and photos of many more Korean cars than were visible when I was there, so if you’re interested, check it out. Unlike me, she can obviously read Korean, as she had much more information on the vehicles. 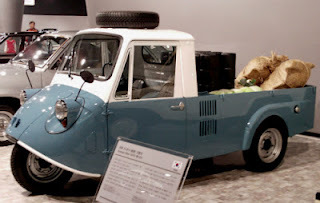 According to Wikipedia, South Korea’s automotive industry only goes back to 1955 when they started making cars from jeep parts. Kia’s been around since 1964, though not under that name—they originally had a licensing arrangement with Mazda. Hyundai shows up in 1968, working with Ford. They’ve since acquired Kia. Samsung started business in 1998, bad timing on their part due to a financial crisis in Asia. They are currently mostly owned by Renault. These three manufacturers currently produce most of the cars on South Korea's roads. There’s a good description of Kia’s history on Perrys blog. It talks about Kia’s first vehicle, a three-wheeled truck called the Master K-360. 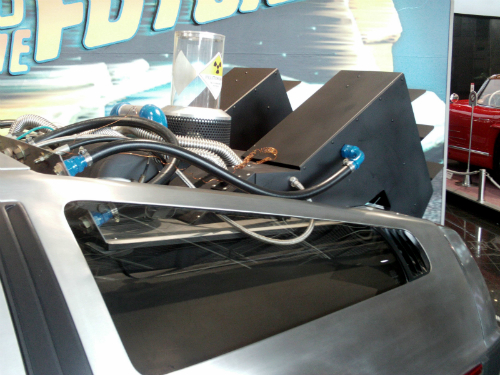 Looks like the same vehicle as the T-600 at the museum, but the only mention of the T-600 is under the entry for the Kia Brisa. This thing is small, but there are still a lot of small trucks on South Korea’s roads. The low bed is also typical of many of the newer trucks I saw while I was there. I have this in my notes as a 1979, but the website says it’s a ’76, so we’ll go with that. 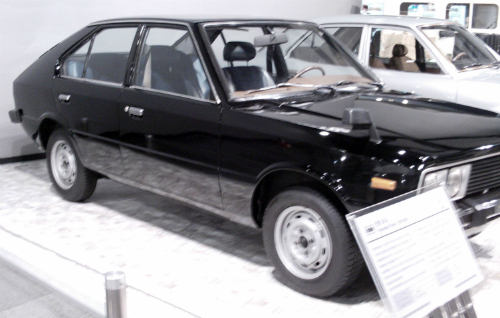 Either way, this four door sedan would be a first-generation Pony (1975-1982). 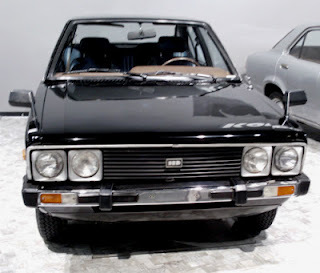 Wikipedia says it was meant to compete with the Kia Brisa (next in the line-up) and was designed by several British engineers, including one who had been involved with the Morris Marina. That’s not exactly a recommendation. I remember my parents driving one of those, though ours was an Austin rather than a Morris, and it was after that my dad stopped buying Austins. He said it was a real lemon. Now that I’m looking at it, I can see the family resemblance. I’ll have to check my old albums for possible photos of the Marina to scan in so I can post them side by side. 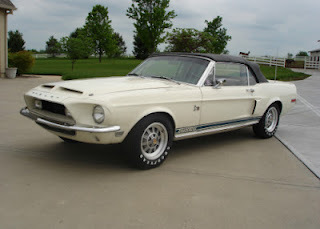 Wikipedia goes on to say that the Pony was tested by Motor magazine, and was found to have a top speed of 92 mph and could do 0-60 in 15.3 seconds. 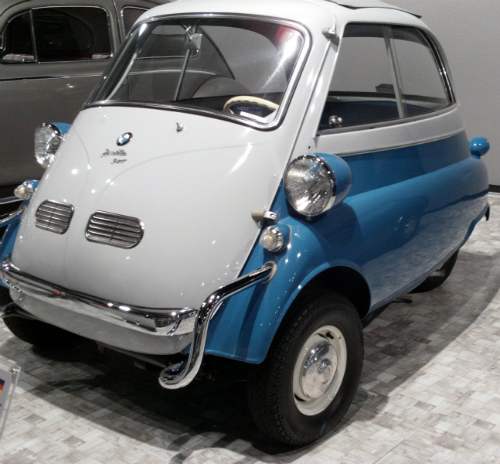 Definitely not a sports car, but it was exported to several European countries. The second generation (1982-1990) was even exported to Canada, where it apparently did well, as it was inexpensive. Can’t say I remember ever seeing one before my trip to the Samsung Museum. 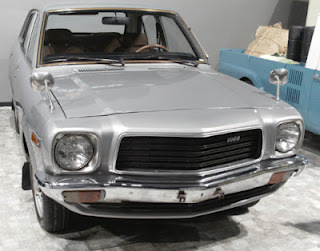 Wikipedia says the Kia Brisa is based on the Mazda Familia. 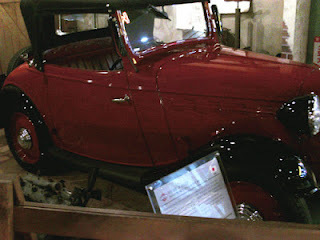 The first Brisas were pickups, before they started producing cars. They were only built from 1974 to 1981, at which point the government decided light trucks were more important. There must have been considerably fewer cars on South Korea’s roads back then. 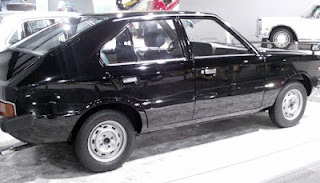 Apparently only 31,017 Brisa cars were built, and yet it looks like a car meant to be affordable. I apologize for the picture quality on this one. It was meant to look like it was in a garage, and the area was consequently poorly lit. You can find all kinds of details about the Model 15 at earlydatsun. 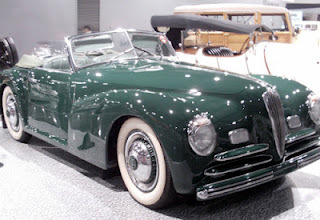 This was a nicely restored car and I would have liked to have seen more Asian cars from this period. We’ve now covered all the categories for the main floor except Cars in Film, but I still have photos of several cars I haven’t discussed, so I guess I’ll need to invent a new category. Here are the remaining three vehicles the museum considers classics because they’re handmade and rare. 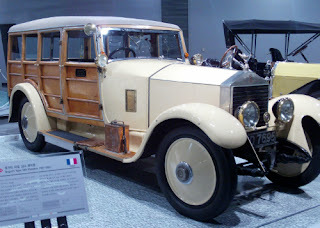 Yes, a Rolls woodie, built for carrying shooting parties or shuttling house party guests to and from ye old stately manor. Seems to be a few of them online, of various vintages, many of them for sale. I suspect the upkeep could be a factor—the insurance alone would be too much for most of us. You can get an idea of prices at vintagerollsroycecars. The day I looked, a 1928 shooting brake was available for a mere £180,000. 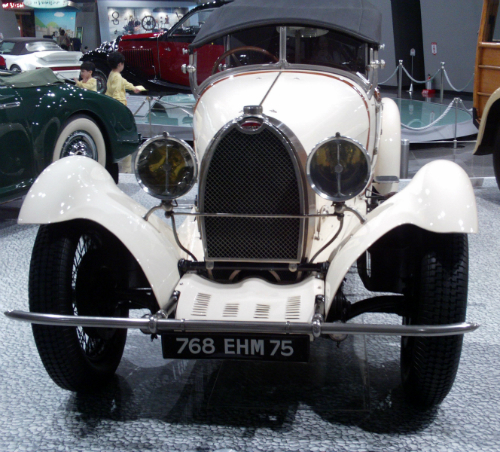 Was there ever a Bugatti built that wasn’t a classic? Or rare, for that matter. There are lots of details (and photos) on various Bugattis at supercars.net. 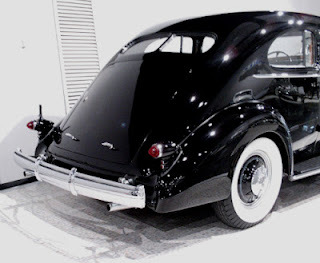 They say only 385 Type 38s were built in all, and of those, only 39 were 38As like this one, distinguished from the others by having a supercharger. Even back then, the Bugatti was a supercar. 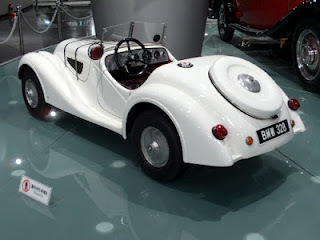 While this one doesn’t have the elongated teardrop-shaped fenders I associate with Bugatti, it is long, low and lean. 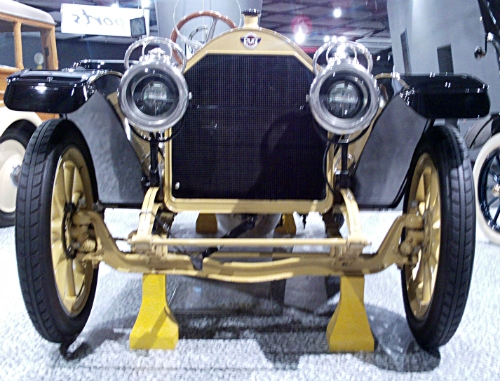 Like other prestige automobiles of the time, the bodies for earlier Alfa Romeos were made by many different coachmakers, including Pininfarina of Ferrari fame. 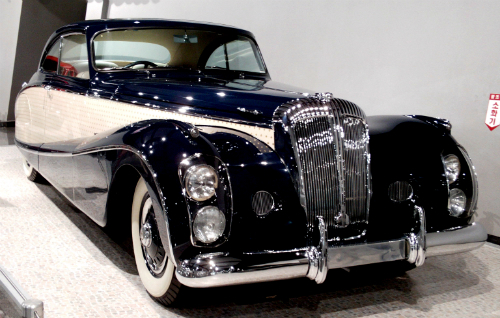 The 6C 2500 was the first built after the war and, according to Wikipedia, was bodied by Alfa itself. SS stands for “super sport” and the 2500SS was the top-of-the-line model (excepting the Tipo 256 race car), with a double overhead cam engine with three carburetors. It seemed quite popular with the school group that was touring the museum. You can see a couple of them admiring it in the background of the Bugatti picture. I don't blame them. There were only five cars in this section of the Samsung Museum, only two of which are old enough to qualify as classics. However many of the cars in the rest of the museum—the Alfa Romeo for example—could easily be put here. Here are the two classics, again in chronological order. Eh, who am I kidding? Also in my order of preference. That is really cute. I can’t decide if I like this or the 1962 VW Karmann Ghia better. I know, sacrilege even to make the comparison. 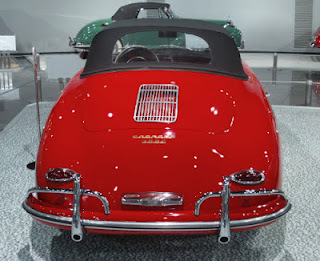 Wikipedia says the 356 Speedster was the suggestion of American dealer Max Hoffman, who I believe was also the one who convinced Mercedes to put the 300SL into production. Smart guy. 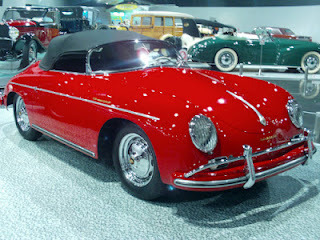 This one I don’t find so appealing, yet like the Ghia it was built by Karmann. 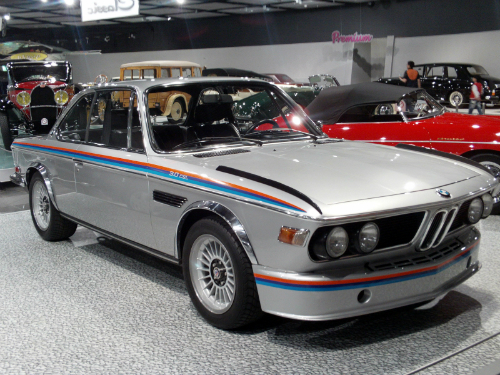 Again according to Wikipedia, the 3.0CSL was manufactured so that BMW could compete in the European Touring Car Championship. Consequently it was built light and powerful. The first two BMW art cars were 3.0CSLs, painted by Alexander Calder and Frank Stella respectively. This particular model doesn’t have the wings and air dam seen on later models. Looks like a rally car. And as long as we’re talking BMWs, check out this child-sized BMW 328 the museum also had. Wondering what the other three sports cars were? A 1993 Porsche 911 Turbo Cabriolet, a 1994 Mazda RX7, and a 1992 Honda Acura NSX. 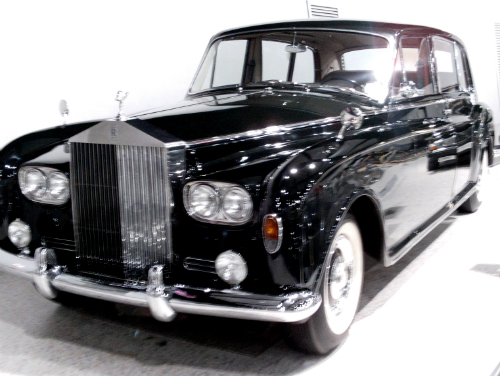 More luxury automobiles at the Samsung Museum, still in chronological order. 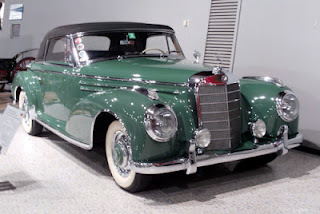 Yes, not only was the museum displaying the 1950s 300SL coupe and roadster, it also has an example of the 300SC. Unlike the other two, this one was built for comfort, but don’t think that meant it couldn’t perform. Wikipedia’s article on the 300 types say it was roughly equivalent to today’s S class. Top of the line, in other words. While this particular version is a sporty two-door, they also came in various four-door formats, with options including mobile phones and dictation machines (yes, back in the ‘50s!). 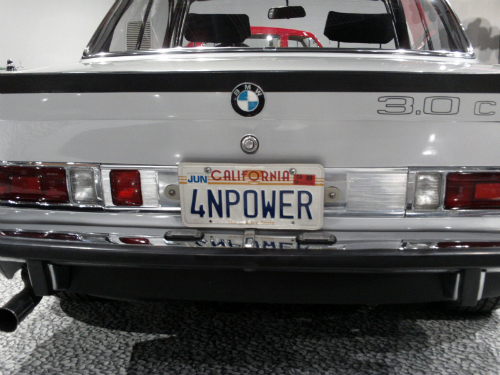 The inline-six under the hood had fuel injection, putting out 173 horses. Naturally, it’s a rare car. Of the 200 300SCs built between 1955 and 1958, only 53 were roadsters. 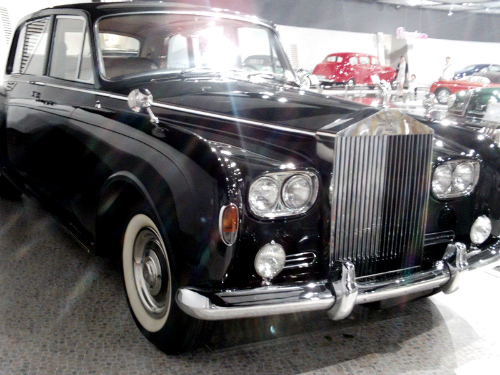 While the Rolls is the epitome of luxury cars, I’ve got to say it looks a little stodgy for something made in 1969. In fact, it doesn’t look out of place among the 1950s luxury cars I’ve already covered, with less interesting lines. And yet, according to Wikipedia, the Phantom VI only started production in 1968. Only 374 were ever made, from 1968 through 1991. Not surprising, given the limited market. There are apparently two in Queen Elizabeth’s fleet, including one custom-built in 1977 to celebrate her silver jubilee and presented to her by the British motor industry. The same car was used to carry Kate Middleton to her marriage to Prince William. You can see a picture of it here though not with the royal bride. 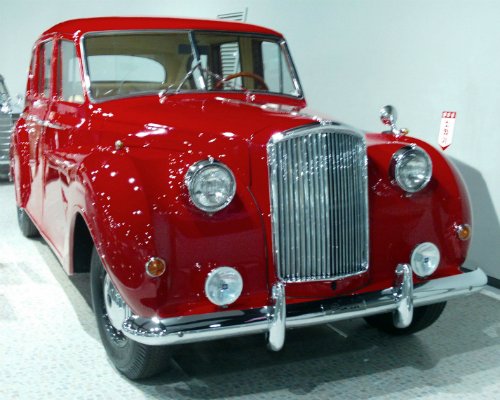 The museum’s Rolls is a two-door (and left-hand drive), but four-door versions were also made. The Truth About Cars says this model was the last of the really big American cars. And at 233 inches long and somewhere around 5,000 pounds, it WAS big. I’ve always thought of Lincolns as a poor second cousin to the Cadillac (after all, how many Caddys are used as airport limousines?) but this one is impressive. There were actually two other cars in this section, a 1972 Mercedes-Benz Pullman (sounds like it should be a train) and a 1982 Volvo 264 TE Landaulette. Sorry, no photos. I don’t even remember seeing the Mercedes. As for the Volvo, well, it was a Volvo station wagon from the ‘80s and totally didn’t appeal to me. I realize now that I should have shot it anyway—after all, it wouldn’t be in the museum if it wasn’t significant. So I apologize to any Volvo fans out there. On to the luxury automobiles at the Samsung Museum, and there are some lovely ones. Might as well take them in chronological order. This is a gorgeous car—makes me think of gangsters and prohibition. Love the waterfall grille and the rear fenders. 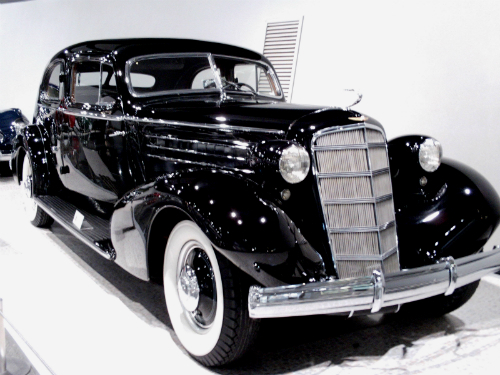 It wasn’t actually top-of-the-line at the time as Cadillac also made a V-16. 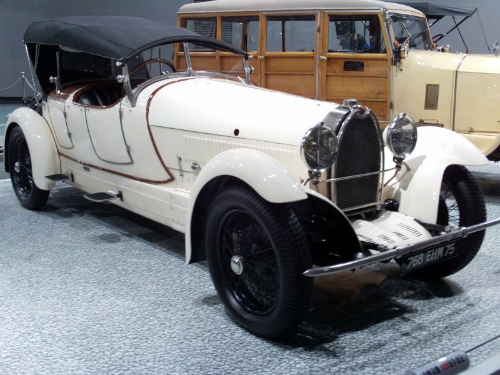 Neither of them sold in huge quantities as few were willing or able to buy expensive cars during the Depression. HowStuffWorks suggests that people found them “socially inappropriate” and preferred the V-8 models. If you want lots more details, check out their website. They say the V-12 put out 135 horsepower and would cost you between $4,000 and $5,000, which was a lot of money at the time—more than the price of a house. This was a stunning car. Unfortunately it was positioned so that it was hard to get photos, which is too bad because I really wanted to show off the paint job. The cream-coloured section is actually covered in a tiny gold floral—I’ve never seen anything like it. Once again we have a waterfall grille. 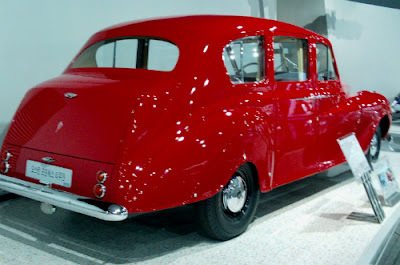 Though I associate Daimler with German cars, according to Wikipedia these were built in the UK by the Daimler Motor Company with a license to use the Daimler name. Founded in 1896 and technically still in existence, they’re Britain’s oldest car manufacturer. Daimler limousines have been used for driving kings and queens, both British and other. The paint job on this one makes me wonder if it might be one of them. What a surprise to see a limousine in red! I like it. According to Wikipedia, this was Austin’s top of the line, and I don’t doubt it. Surprisingly for a car this size, there’s only a straight six under the hood. The Austin Princess will do 90 mph, but it takes a while to get there, with 0-60 being achieved in 20 seconds. 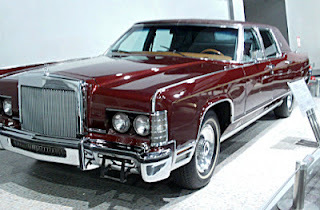 The limo version, as tested by The Motor magazine, had a top speed of 79 mph and did 0-60 in 23.3 seconds. Speed wasn’t really the point, though. I hear they were popular as wedding cars. Probably still are, if you can actually find one. After the lobby and the Focus Exhibit comes the main gallery of the Samsung Transportation Museum. While the gallery is one big room, the museum has divided the cars into five categories: public, sports, classic, Korean, and premium. The four cars in the public section are ones that were mass-produced and relatively affordable. 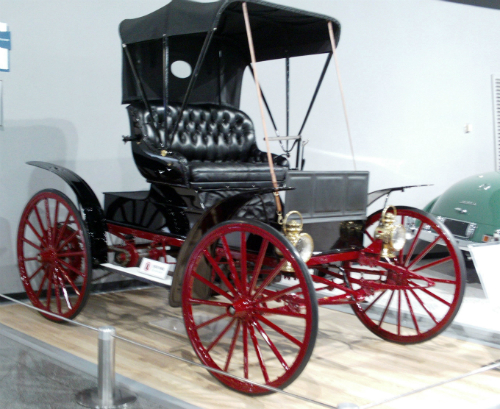 This is where the mass-produced automobile began. According to Wikipedia, over its production lifetime (1908 through 1927) some 15 million Model Ts were produced by Ford. 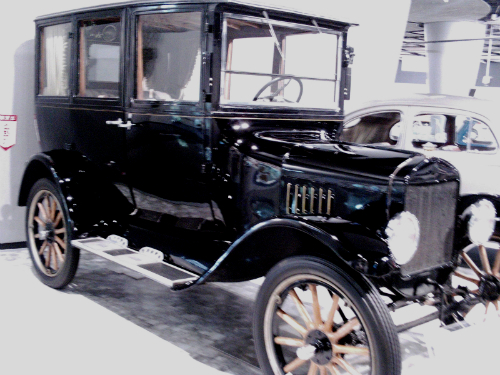 The Model T didn’t just put middle-class America on the road. It was also built in plants in Australia, South America, and Europe. 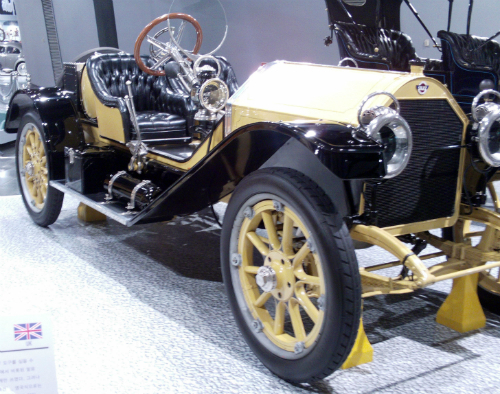 The Model T had a four-cylinder engine producing 20 hp, and could do 40-45 mph, though I’d hate to try it. 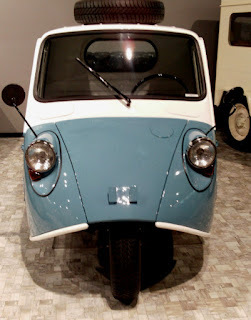 It got 13-21 mpg and could run on ethanol, gasoline or kerosene (gasoline was originally a waste-product from the kerosene refining process). The one in the museum appears to be a two-door coupe, but there were also four-door sedan and touring models, and also roadsters available. What the Model T was to America, the Volkswagen Beetle was to postwar Germany. Its name actually means “people’s car.” Over 21 million of the original Beetles were built from 1938 to 2003. Like the Model T, it was built not just in its own home country but in plants worldwide. Ferdinand Porsche (yeah, that Porsche) had a hand in its design. While the Beetle has Nazi connections in its past (you can read the whole story on Wikipedia), it was a good and economical car, and deserves its iconic status. Besides, it’s so cute! Seems I didn’t shoot any footage of the Beetle, probably because it’s not exactly a rare car. You can see it in this brief video clip I took of the main gallery, however. Heh. 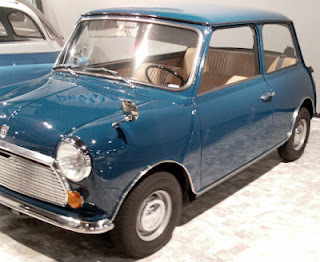 I don’t think of the Mini as an economy car, especially now that they’re made by BMW, but I guess it was if you lived in the United Kingdom. 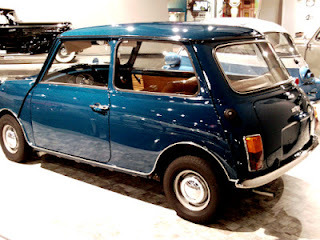 My parents drove a Mini Cooper station wagon of about this vintage (a year or two older, but the same generation) when I was a kid and I doubt it was cheap, but then it had to be imported. I note that the picture of the Mini on the museum’s website is NOT the car in question. Nice looking car, though. Our Mini was blue like this one (apparently built for export since it’s left-hand drive) but had extra space behind the back seat. Yeah, it’s small, but if you flipped the back seat down, there was even room for my sister and me to sleep on long road trips. Umm. I dare say it was cheap, but with only 161,728 vehicles sold over eight years (Wikipedia), I wouldn’t really consider it as something bought by the public at large. It’s really just a bike with a cover. Bet it was easy to park though and got great mileage. If you’re wondering about the lack of doors on the side, that’s because the whole front opens up. They claim it will do 53 mph. Yikes!